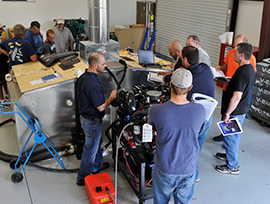 Our partners at Volvo Penta have been offering technical training classes for dealer and OEM service technicians. They have recently announced an expansion of the service school offerings for technical training. Volvo Penta instructors will conduct the classes at the schools’ campuses, and also include train-the-trainer sessions for the schools’ technical teachers to conduct future classes. For more info about the classes, contact Volvo Penta. At Pacific Power Group, we provide power solutions that are innovative, cost-effective and best-in-class. Our knowledgeable sales staff, cutting-edge engineering team and expert factory-trained service technicians can help your marine power needs. Centralized in Kent, WA, Pacific Power Group marine division specializes in sales, engineering and service of MTU, Volvo Penta and Perkins products. Our technicians have received Volvo Penta factory training.